To stand out among the thousands of video games released on computers, phones, and social media sites every year, you need a hook. 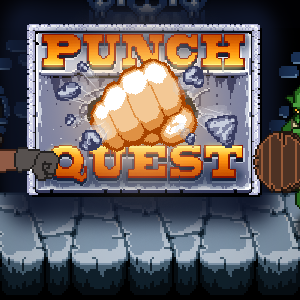 Canada’s Madgarden took that advice literally when developing Punch Quest for iPhone and Android, which quickly became one of the world’s favorite endless-runner slugfests. Paul Pridham is the mad scientist of Madgarden, and he took a few minutes away from creating the upcoming Death Road to Canada to answer questions about creating games for today’s demanding audiences. TDS: Do you get tired of people asking you how you became a game developer? Pridham: I don’t actually get asked that too often. TDS: Then please tell us! Pridham: I’ve been making games off and on since I was 10 or so, starting on a Commodore 64. After high school there was a brief hiatus where I didn’t think making games was something you could do for a living. I call that my period as a “professional software developer.” But then the iPhone came around and things started looking up again. Saved up some money, started on some projects, and eventually quit the job to do this full time. Haven’t looked back. FlapThulhu, Madgarden’s take on the Flappy Bird craze. TDS: Do you sit down with the idea of making “an iPhone game” or “a desktop computer game,” or do you start with the game and then pick the platform? Pridham: I start with the game, and then figure out how to get it to play well on whatever the platform is. I like to target iPhone and iPad because the restrictions of the interface really make me try hard to streamline how people interact with games, so that it’s not more complicated than it needs to be. TDS: With so many games out there, how do you keep pushing yourself to create new ideas and attract new players? Pridham: There are so many ideas on my to-do list already that it’s really not a problem for me to come up with stuff. It can be tricky to figure out what is the best thing to work on, though, what will appeal to people but also be fun to work on. I think they’re quite interrelated. I try to overlap my projects and do a lot of prototypes so even when I don’t quite hit the mark, I have still explored new ideas and solved new problems that I can carry forward to the next project. TDS: Is there any amount of money that would convince you to switch from game development to, say, writing high-frequency trading algorithms for brokerages? Or is there an accomplishment that would let you know that you’re “done” in games and it was time to move on to another challenge? Pridham: No brokerages for me. Hell no. I suppose if I make enough money to “retire” early, I will just relax a bit and explore these possibilities (while making more games anyway). I don’t think I’ll ever be done… too many things I want to try yet. TDS: Death Road to Canada combines “city exploration, supply looting, zombie thwacking, and rescuing people that you cram into you car.” The whole thing sounds and looks like a 1970s drive-in movie. Was that what you were going for? TDS: You used Kickstarter to fund development of Death Road to Canada. What makes a game Kickstarter-worthy? Pridham: Any game can be Kickstarter worthy. It’s all up to the backers, if it’s something they want to support and see come to fruition. Also, zombies. TDS: You’re working on another game, Arecibo Man, which has the feel of a classic arcade game. Many young people with iPhones today have never put a quarter in an arcade machine. What keeps that style alive? Arciebo Man, an upcoming throwback arcade game. Pridham: The purity of the gameplay, hyper-iconic and abstract visuals and sounds, and the fact that you can pick up and play. You just don’t get that with Warzone Simulator Xtreme: Xtreme Warzone.